With a vibrant and lively downtown arts and culture scene flourishing amidst an ongoing revitalization, it doesn't take too much effort to quickly fill up a day trip to the city of Tacoma. Located just north of Joint Base Lewis-McChord on Interstate 5, Washington state's third largest city is home to a host of theaters, galleries, museums, shops and restaurants worth checking out while getting to know Tacoma. A great introduction to the city is a self-guided tour through the downtown core on the free commuter Link Light Rail train. Using the free parking garage at the central Tacoma Dome transit terminal (424 E. 25th St.), it's easy to hop directly onto the train for the short ride into downtown. 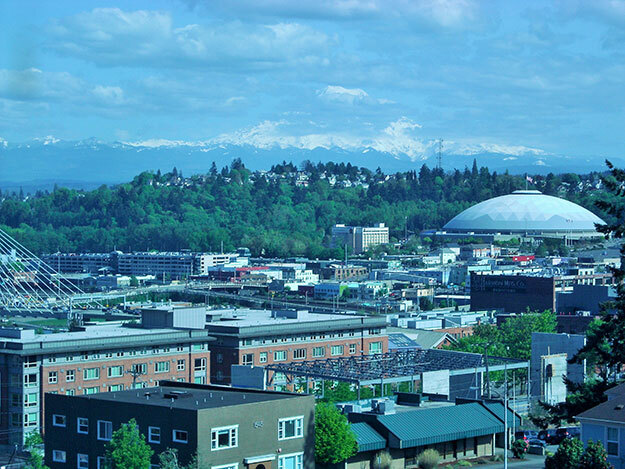 Along the route, you'll pass city landmarks like the Tacoma Dome (tacomadome.org), the largest clear span wooden dome structure by volume in the world; as well as the 1911 Union Station, built in the grand Beaux-Arts style as the western terminus of the Transcontinental Railroad. If you aim your gaze to the north while passing E. 26th St., you can barely catch a glimpse of the pink Almond Roca factory (brown-haley.com), the largest exporter of confections in the United States. 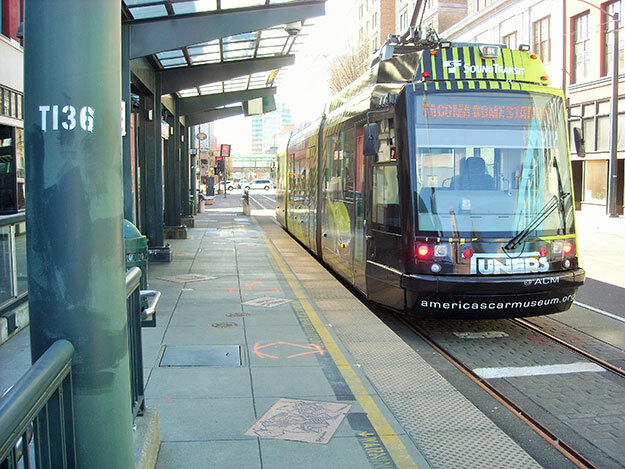 Light rail is an excellent way to sightsee, shop, and dine for a day without the hassle or cost of driving and parking. Tacoma Link provides complimentary service from one end of downtown to the other with a total of six stops: the Tacoma Dome, S. 25th St., Union Station, the Museum District, the Convention Center and the Theater District. Link runs 365 days a year and travels the line approximately every 10 minutes. Hours are Monday-Friday, 5 a.m. to 10 p.m.; Saturday, 8 a.m. to 10 p.m.; and Sunday, 10 a.m. to 6 p.m. Check the schedule for train frequency at: traveltacoma.com/plan/link-light-rail. Making things even more convenient, Tacoma has three nationally recognized museums within walking distance of one another and from the Museum District light rail station. The Tacoma Art Museum (tacomaartmuseum.org) displays works from its impressive permanent collections of Northwest art and hosts rotating traveling exhibitions. The museum also is host to a permanent display of glass works by Tacoma native and world-renowned artist Dale Chihuly. If it's time to eat, the museum has a café. Next door, the glass-art theme continues at the Museum of Glass (museumofglass.org). The glass museum's signature 90-foot silver cone (the chimney of the working glass studio inside) dominates the skyline. Visitors to the studio hot shop amphitheater watch skilled glass artists blow and mold masterpieces of molten glass. The museum's three galleries host permanent and traveling exhibits of glass art and contemporary art. The Chihuly Bridge of Glass, a 500-foot pedestrian walkway, connects the Museum of Glass to the Washington State History Museum plaza and to the Thea Foss Waterway promenade that fronts the neighboring museums, and leads to the maritime museum of the Foss Waterway Seaport (fosswaterwayseaport.org). The pedestrian bridge has three Chihuly glass installations open to the public 24 hours a day. The nearby Washington State History Museum (washingtonhistory.org), is built in red brick and mimics the architecture of the restored historic Union Station next door, now a courthouse. Even here, in the history museum's rotunda, Chihuly glass is on display, this time in the form of a dramatic chandelier containing 600 blown-glass forms. The museum's interactive exhibits, high-tech displays, and historical artifacts tell the story of Washington, examining the people, places, and industries that shaped the state from the Native Americans to logging, aviation and computer technology. Children are the target audience for the museum's History Lab. Toward the end of the Link line is Tacoma's Theater and Antiques District. The city of Tacoma's Broadway Center (tacomaartslive.org) program provides a full slate of live entertainment at three Tacoma theaters: the Pantages, the Rialto, and Theatre on the Square. The theaters are home to many local arts groups offering a variety of entertainment. The venues also host world-class touring groups, including ballets, symphonies, live comedy, musicals, concert bands and popular music performances, along with other special events. Looking north just two blocks from the final light-rail stop, the stately black and white Elks Temple (565 Broadway) can be seen after a massive refurbishing project to make it the newest McMenamins' property in the Northwest. The top floors are hotel rooms, with multiple restaurants, bars and a live-music venue throughout the remainder of the seven-story structure, even a retail gift, beer and wine shop on the ground floor (mcmenamins.com/elks-temple). Back at the beginning of the line on your return trip, check out Freighthouse Square (2501 E. D St.) Right across the street from Tacoma Dome Station, the converted, early-1900s warehouse building has restaurants, specialty shops, antiques, and art galleries perfect for strolling before or after a day in downtown. 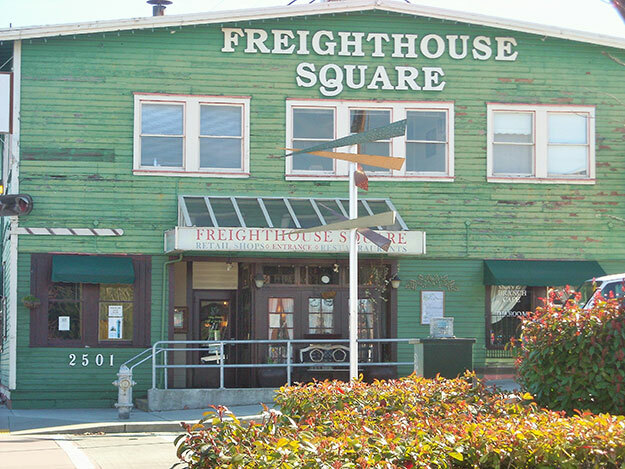 The restaurants at Freighthouse Square are great for a casual meal, with choices including seafood and Thai cuisine. If you're after a more refined dining experience, consider two nearby options. Check out stunning city lights views just up the hill at Stanley & Seafort's Seafood and Chophouse (115 E. 34th St., stanleyandseaforts.com); or indulge even more at ultra-swanky steakhouse El Gaucho Tacoma (2119 Pacific Ave., elgaucho.com/dine/tacoma), complete with live piano music, tableside carving and flaming desserts. A great resource for Tacoma information is the Travel Tacoma + Pierce County Visitor Information Center, 1516 Commerce St., 800.272.2662, traveltacoma.com.